For the past few months, the Air Jordan 7 “Gold Medal” that will be released along with an Air Jordan 6 in the so-called “Golden Moments” pack has been making waves. Due to the anticipation it created, Jordan Brand decided to release the Air Jordan 7 “Gold Medal” in a GS size also on the same day as the “Golden Moments” pack – August 18. 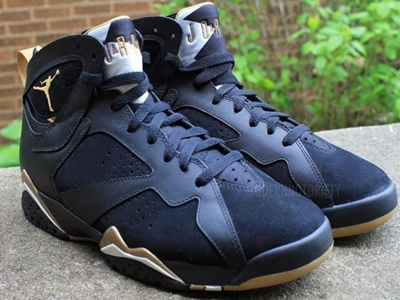 Like its counterpart, the Air Jordan 7 GS “Gold Medal” sports a black leather and nubuck upper accented with gold hints on the lining, branding, and outsole. Make sure to check this one out next month!